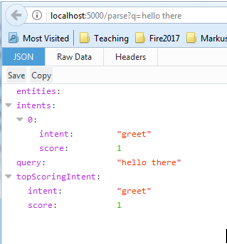 In this brief tutorial I’ll walk you through using a popular Python language library to construct a simple chatbot that evaluates and responds to user input. What do we do when we need any information? Simple: “We Ask, and Google Tells”. But if the answer depends on multiple variables, then the existing Ask-Tell model tends to sputter. State of the art search engines usually cannot handle such requests. We would have to search for information available in bits and pieces and then try to filter and assemble relevant parts together. Sounds time consuming, doesn’t it? This Ask-Tell model is evolving rapidly with the advent of chatbots (also referred to as just “bots”). This article talks about the development of a bot for extracting information related to the recently introduced Goods and Services Tax (GST) in Malaysia. Being a relatively new concept, a lot of people are still trying to understand how it works. Chatbots can provide such information in a natural and conversational way. 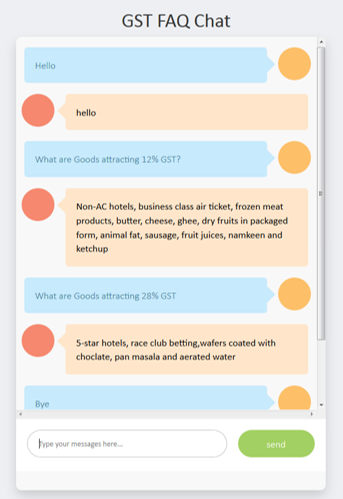 This article demonstrates building a chatbot for answering queries related to GST. Let’s call this a GST-FAQ Bot! To know more about GST, like how to apply for registrations, tax slabs, etc., companies have posted Frequently Asked Questions (FAQs) on their websites. Going through that amount of information can be a painstaking process. In these situations, chatbots come in handy, effective and thus, have become enormously popular. These days, Natural Language Processing (NLP), especially its component Natural Language Understanding (NLU), has allowed bots to have a greater understanding of language and context. They are becoming more intelligent in understanding the meaning of the search and can return very specific, context-based information. Applications like WhatsApp, Facebook Messenger, Slack, etc. are increasingly being used by businesses. Bots are starting to replace websites-interface as well. From the considerable number of choices available for building a chatbot, this particular implementation uses the RASA-NLU library in Python. Many chatbot platforms are currently available, from rudimentary rule-based AIML (Artificial Intelligence Markup Language), to highly sophisticated AI bots. Some popular chatbot platforms are API.ai, Wit.ai, Facebook APIs, Microsoft LUIS, IBM Watson, etc. 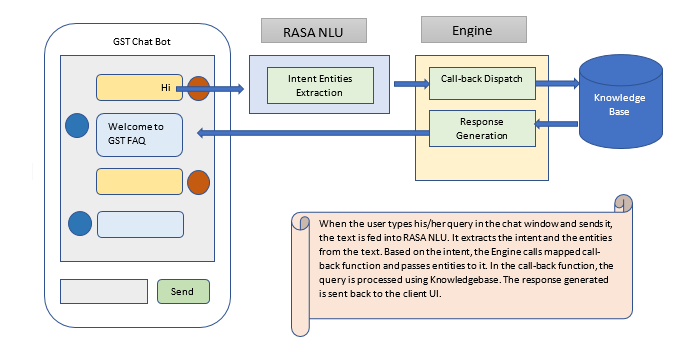 RASA-NLU builds a local NLU (Natural Language Understanding) model for extracting intent and entities from a conversation. It’s open source, fully local and above all, free! It is also compatible with wit.ai, LUIS, or api.ai, so you can migrate your chat application data into the RASA-NLU model. Below is a demonstration on how to install RASA-NLU and build a simple FAQ bot in Python. RASA-NLU is made up of a few components, each doing some specific work (intent detection, entity extraction, etc.). Each component may have some specific dependencies and installations. Options like MITIE (NLP + ML), Spacy and Sklearn are available to choose from. We will be using Spacy-Sklearn here. Client UI can be a web page (using frameworks like Flask in Python) or a mobile app. Flask is simple to code and runs locally. Use pip install flask. A RASA-NLU platform needs to be trained before we start using it. We need to supply it with a few sentences and mention which are the intents and entities in it. Intents are the actions/categories of the sentences and entities are the necessary variables needed to fulfil the actions. For example, “I wish to book a flight from Kuala Lumpur to Singapore on 27 March” has “flight-booking” as the intent and “Kuala Lumpur”,” Singapore” and “27 March” as the entities. Similarly, many training examples can be used so that the RASA-NLU model is trained on different ways of extracting intents/entities from our domain conversations. intent: action or category, in this instance “restaurant_search”. This is typically the call-back function name. entities: array of entities. Here, there are two. One is of type ‘location’ with value as ‘centre’, whereas the other is of type ‘cuisine’ with value ‘chinese’. ‘start’ and ‘end’ specify beginning and ending indices of the word in the sentence. We can now look at the remaining components of our GST FAQ bot. This is the heart of the chatbot. Based on the intent received from RASA-NLU, it dispatches the entities to the mapped call-back functions. The function in turn, depending on the entities, calls Knowledgebase to get the response. Once the response is received, it is sent back to the UI. Knowledgebase can be as simple as a dictionary of questions and answers, or as sophisticated as one can imagine/require (like databases, internet sources, etc.). This article, being minimalistic for demonstration purposes, fetches pre-coded responses from the dictionary. User text is sent to the RASA-NLU server using http://localhost:5000/parse. Its response contains the intent and the entities. Depending on the intent, functions like gst-info and gst-query are called. Their responses are then sent back to the UI. 2. Execute the Flash app, by running the localhost at the given port, say 8000. 3. Start typing commands in the bottom chat window and click “Send”. 4. Typed messages and their responses appear in the window above, as seen in the adjoining picture. This tutorial presents just a small example, demonstrating the potential to develop something full-fledged and practically useful. Our GST Q&A bot can be enhanced on various fronts, such as expansion of knowledgebase (i.e. number of questions and answers), better training to find more intents and entities, Natural Language Generation of the responses to have a human language feel, etc. GST FAQ Bot is just one example of building an intuitive frontend using government information. With the availability of more APIs and open public data, we can build similar (if not better) bots for those databases. Imagine interacting with government departments using a chatty bot! Hope this interactive guide to writing AI chatbot in Python help to understand the basic of the future tech.